These are all item in my closet from seasons past. I was happy to see that for this season they are are still very much in style. If you are looking for a great animal prints Chico's is always a good source. Check here. The ones I have are Lauren from several years ago as well the tan leather skirt. 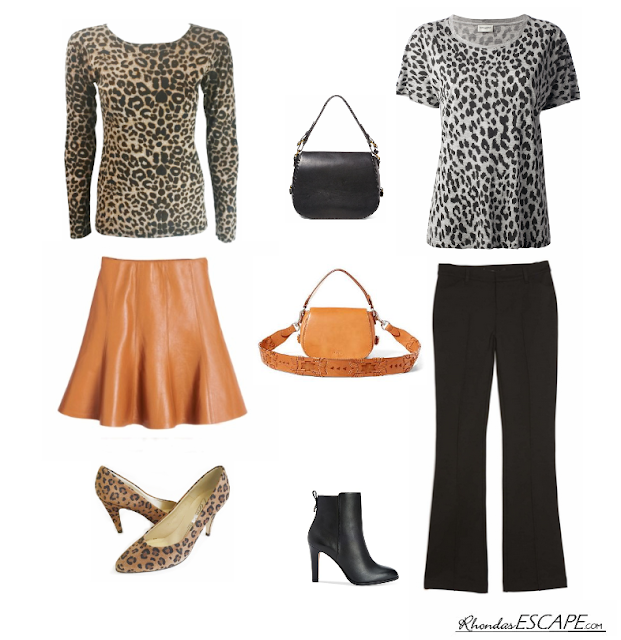 The black outfit would work as well with my black Talbots leather skirt. Talbots seems to have a good selection of leather skirts each year and is a good addition to your wardrobe. An investment purchase and year-after-year, always in style. I love the feel of leather. Notice that the black pants could go with either top. The Coach ankle boots are from last year, purchased at Dillards on sale. With a little bit of effort you should be able find them or something similar. They never seem to go out of style and always look great with pants. If I were taller, maybe I could get away with them with skirts, but for me pants are my best option with ankle boots. Deborah over at Fabulous After 40 has the suggestion of pairing animal prints with a dash of red. A great look and combination. Check out her fashion layout. Also Just Trendy Girls as a great layouts on Ralph Lauren handbags and boots. Shop your closet and plan your ESCAPE.